Flow cytometric analysis of wild-type (green) and TSC2 knock-out (blue) MEFs using Tuberin/TSC2 (D93F12) XP® Rabbit mAb (PE Conjugate). 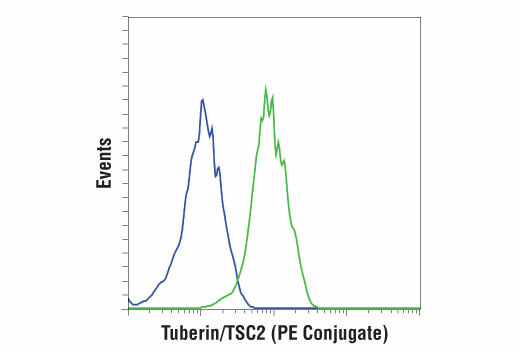 Tuberin/TSC2 (D93F12) XP® Rabbit mAb (PE Conjugate) detects endogenous levels of total tuberin protein. Monoclonal antibody is produced by immunizing animals with a synthetic peptide corresponding to carboxy-terminal residues of human tuberin protein. This Cell Signaling Technology antibody is conjugated to phycoerythrin (PE) and tested in-house for direct flow cytometry analysis in mouse cells. This antibody is expected to exhibit the same species cross-reactivity as the unconjugated Tuberin/TSC2 (D93F12) XP® Rabbit mAb #4308. Tuberin is a product of the TSC2 tumor suppressor gene and an important regulator of cell proliferation and tumor development (1). Mutations in either TSC2 or the related TSC1 (hamartin) gene cause tuberous sclerosis complex (TSC), an autosomal dominant disorder characterized by development of multiple, widespread non-malignant tumors (2). Tuberin is directly phosphorylated at Thr1462 by Akt/PKB (3). Phosphorylation at Thr1462 and Tyr1571 regulates tuberin-hamartin complexes and tuberin activity (3-5). In addition, tuberin inhibits the mammalian target of rapamycin (mTOR), which promotes inhibition of p70 S6 kinase, activation of eukaryotic initiation factor 4E binding protein 1 (4E-BP1, an inhibitor of translation initiation), and eventual inhibition of translation (3,6,7). Sparagana, S.P. and Roach, E.S. (2000) Curr Opin Neurol 13, 115-9. Aicher, L.D. et al. (2001) J Biol Chem 276, 21017-21. Dan, H.C. et al. (2002) J Biol Chem 277, 35364-70. Goncharova, E.A. et al. (2002) J Biol Chem 277, 30958-67.